Meet Lucky Lambrecht. 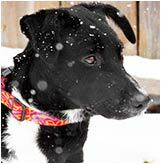 Lucky is a six month old Border Collie mix rescued from the Boulder Humane Society. Like any youngster, Lucky loves running around and hanging out with his new family. After he settles in a bit, you may find Lucky helping out Laura at Bella Frida. 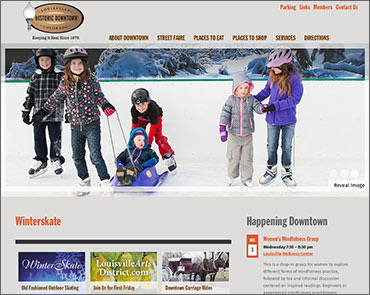 Check out your newly designed website at www.downtownlouisvilleco.com. It’s been five years since we last updated the site and it was time to integrate new technology and adapt to current user trends. We also wanted to more accurately reflect the dynamic community we live, work and play in. The new site focuses on what makes our community so special: the people. We feature retailers, restaurants and Downtown activities with photos by DBA member photographers MaryLynn Gillaspie and Erin Cox. So tell us what you think about our new look. And here is wishing you the happiest of holidays surrounded by the joy and warmth of family, friends and beloved pets. 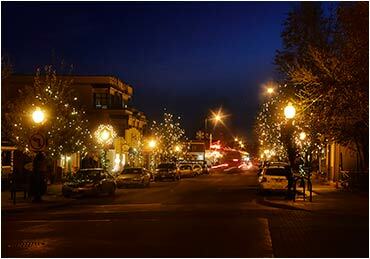 Enjoy the festivities and stroll the streets under the beautiful holiday lights. Art Walk is brought to you by the Louisville Arts District. Check their website for complete details. Holiday Lights are brought to you by the Downtown Business Association. Photo by MaryLynn Gillaspie. Financial advisors Bryan Pieper and Greg Stingari have been awarded the 2014 Five Star Wealth Manager Award. Bryan and Greg are named among other top advisors in the state in the November 2014 issues of 5280 Magazine and ColoradoBiz Magazine. Five Star Professional is an independent third-party research firm, who received over 12,000 nominations among all wealth managers in the Denver area from peers or firms and evaluated the nominees based on 10 objective criteria. Bryan and Greg were among 528 wealth managers who were named 2014 Five Star Wealth Managers. So if you need financial advice... it’s a no-brainer. In honor of Our Lady of Guadalupe, the traditional Mexican dance group, Matachines Guadalupanos will perform in front of the store with beautiful costumes and musicians. You won’t want to miss this heartfelt and colorful performance. Support our local nonprofits like the Art Underground, by donating anytime throughout the day at ColoradoGives.org. Presented by Community First Foundation and FirstBank, Colorado Gives Day raised a record breaking 20.9 million last year. The website features every nonprofit participating in the event so you can donate to your favorite organization. There will also be a link on the Art Underground home page www.artunder.org. Once again the retailers of Downtown Louisville and the Louisville Arts District are offering the Passport program, a great way to save 10 – 50 percent on wonderful merchandise and unique gifts for the holidays. (and have a good lunch or dinner while your shopping). Pick up a brochure at any downtown store or check the ads in the Daily Camera and Hometown Weekly. The Passport program includes boutiques, gift shops, galleries, and restaurants. So shop local for all your holiday needs. 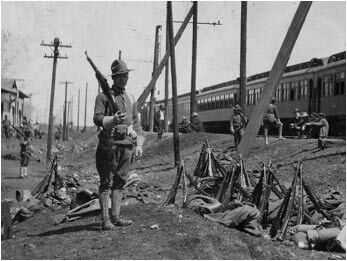 Presented by Historic Museum Coordinator Bridget Bacon, the program focuses on the period of May 1914 to January 1915 when federal troops from the 12th Cavalry in Fort Robinson, Nebraska, were stationed in Louisville to maintain order following the coal strike wars of April 1914. What was this like for the soldiers... and for the residents? Attendees are welcome to bring their lunches. 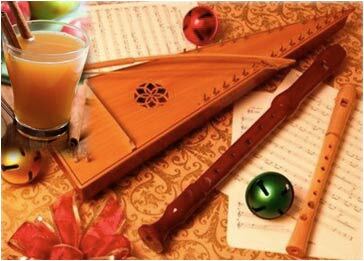 Stop by before the Parade of Lights for the annual Holiday Open House and listen to recorder group Tutti Quintet as they perform their special variety of music for the holidays. 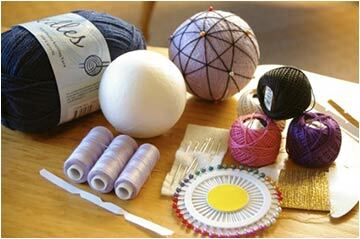 Temari Balls originated in Japan as hand-embroidered friendship balls made to be given away as gifts. The 3-4 inch diameter balls are made from scratch, then decorated with colorful and sparkly yarns and beads. These balls are perfect holiday tree ornaments, decorations, and friendship gifts. No experience or preparation needed. The workshop will be led by local fiber artist Pat Martinek. This is a kickoff event for the Library’s new Makerspace programming. Please pre-register. Space is limited to 15 participants. $10 materials fee per person. This is a drop-in workshop for ages 10 and up. Materials will be provided. 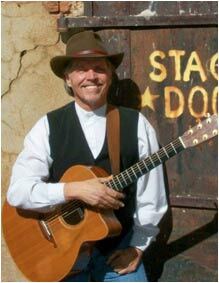 Jerry is a songwriter and Celtic fingerstyle guitarist who has been heard on NPR and PBS. This concert is free and open to the public.